Tri-color penne, tomato, basil, and mozzarella brighten up this cold lemon pasta salad recipe that's perfect on hot summer days. Just a few ingredients can give you a very colorful, very tasty summer dish. Our cold lemon pasta salad recipe is made with tri-color penne pasta, lemon juice, and traditional ingredients like tomatoes, basil, and mozzarella. Enjoy this cold pasta salad especially in the heat of the summer. Perfect for any occasion, the tri-color scheme will remind you of everything you need when summer arrives: sun, company, and a classic pasta salad. Bring a large pot of water to a boil. 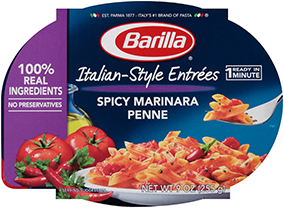 Season with salt and cook penne pasta 1 minute less than package directions. Drain tri-color penne and toss with 2 tablespoons of olive oil, set aside. Combine 2 tablespoons olive oil, lemon juice, tomatoes and basil in a large bowl and season with salt and pepper. Add cold tri-color penne and stir to combine. Add cheese and mix well. Serve cold pasta salad.